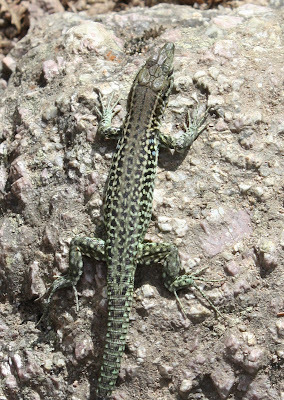 Ths is the Tyrrhenian Wall lizard, Podarcis tiliguerta, endemic to Corsica and Sardinia only. And it was EVERYWHERE we went on Corsica. 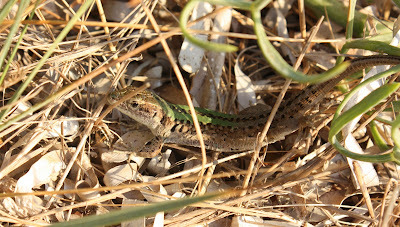 You can find out more about them here, on an excellent site about the reptiles and amphibians of France. Another of the same species, sunning itself on a log. If you look carefully (ordouble-click on the picture for a larger view), there is an orange dot just above the front leg - zoomed in, it is possible to see that it is a tick attached to the lizard. Also, this lizard has lost its tail, a common trait in many lizard species which will drop their tail if attacked by a predator with the intention that the twisting and turning tail distracts the predator and allows the lizard to escape. This one is in the process of growing a new one. We saw quite a few lizards in this state. 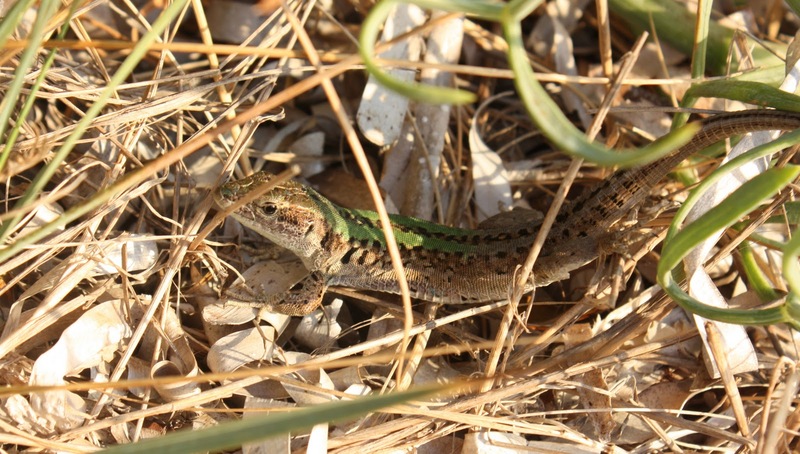 Yet another Tyrrhenian Wall lizard, this time showing some beautiful colouration. Also, if you double-click on the photo, you can take a closer look at the beautiful pattern of plates on the head. This photo, taken by the shore on Cap Corse, in northern Corsica, shows an Italian Wall lizard, Podarcis sicula. And as this is northern Corsica (at Cap Fleuri), it must be the subspecies Podarcis sicula campestris. Again, more information on this beautiful species can be found here, and double clicking on the photo will let you see the glorious green colouration more clearly. 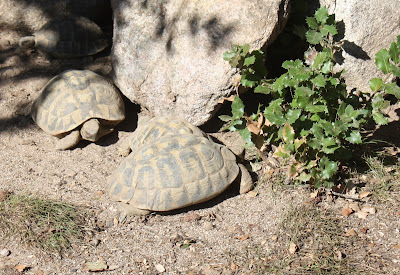 One of our natural history aspirations for this holiday in Corsica was to see tortoises, as we'd managed to do in the wild on the Peloponnese peninsula in Greece previously (even rescuing one that was about to be crushed by a speeding builder's van!). 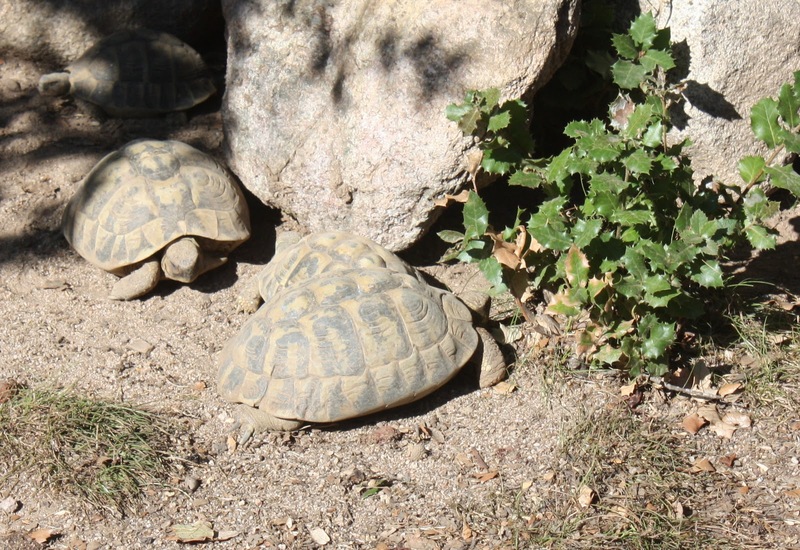 Corsica has one native land tortoise, Hermann's Tortoise, Testudo hermanni, and a native terrapin, the European Pond Terrapin (Emys orbicularlis). 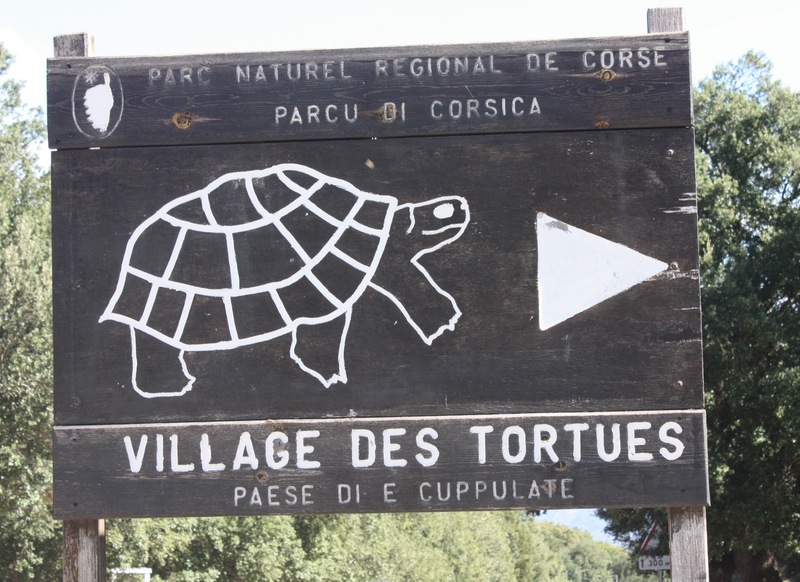 The terrapin can be seen quite widely in Corsica, although we didn't spot it on our journey. 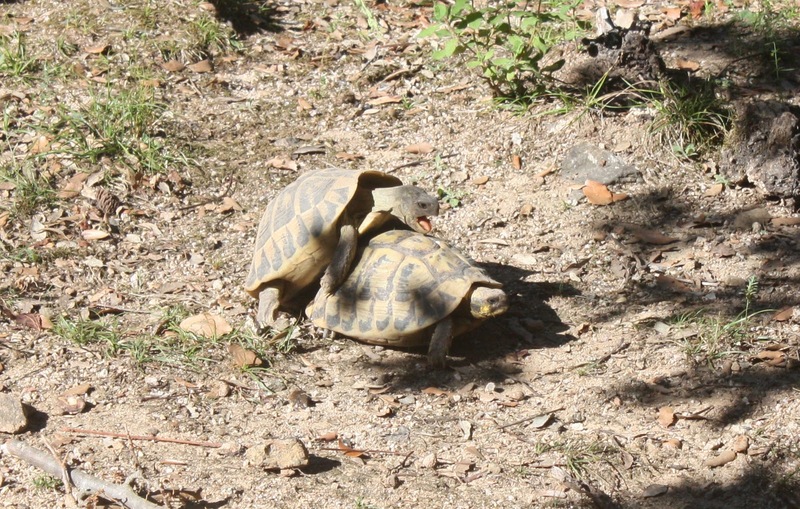 But Hermann's Tortoise, although found throughout the Balkans and on several of the larger Mediterranean islands, has declined dramatically on Corsica over the past decade as a result of habitat loss, brush and forest fires (a major blight on Corsica anyway) and from competition from aggressive non-native Florida Turtles. 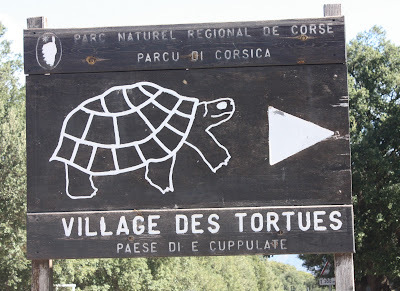 This sign above is for one of the two tortoise breeding and release centres on Corsica (this one near Moltifao) which are aiming to reverse the decline. We certainly managed to see lots of Hermann's Tortoises fairly close up, even if we stuck to the outside of the visitor control barriers (unlike most other visitors who just wandered at will across the whole site - I even told off one French woman who stepped across the fence, picked one up and pretended to kiss it. Idiot. That will really help the conservation effort). I think managers of species conservation projects in the UK might have palpitations at the lack of visitor supervision at the site we were at. And here is the Hermann's Tortoise conservation effort in action. And a noisy little action it is too. Although I had to admire the stamina as it does go on a bit! Lovely photo's SNB. Seems like you enjoyed the break. Never been to Corsica - or considered it actually. Would you recommend a visit?